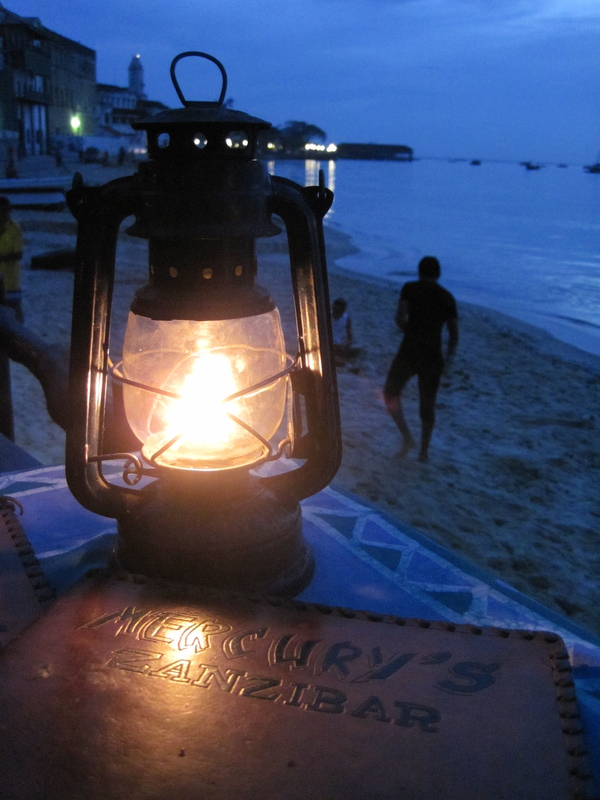 During my time in Zanzibar, I spent about 8 or 9 days in Stone town. I was working most of those days, so I didn’t get to explore as much as I would have liked to, but still I did get to wander down some of the narrow alley ways, through the haphazard zigzagging roads. I found a few good places to eat & drink, though I suspect a dose of poorly refrigerated coconut milk in a Passion Colada I drank in Stone Town was responsible for the food poisoning I previously wrote about in a post about staying healthy during travel….. At any rate, these are some of the highlights. I met a truly lovely British girl during my first week of work in Zanzibar, and we stopped in to one of her favorite spots, just down the street from my hotel, to have a drink or two. We sat on the deck there, overlooking the beach and the water, and stayed for the sunset. There was a group of young men who were using that stretch of beach as their own personal gym, and one guy seemed to be the leader of the group, showing the others some martial arts moves that resembled Brazilian Capoeira. He had them running short sprints and doing sit-ups on the beach, and after that they kicked a soccer ball around. I got the feeling that they were conscious of the eyes watching them from the bar’s deck and that they were showing off for us a bit….. it just goes to show, wherever you are, whatever the dominant culture or religion, boys will always be boys!! 🙂 We took in the scenery and activity before us as the sun set, and we chatted about our respective backgrounds (which is always a highlight of travel for me – meeting new people, who have lived in different places than I have, and from whom I can learn more about different parts of the world). What a great place to get to know someone new, and sip on a local beer! Another thing I really enjoyed was going back to Forodhani Gardens another night with my new friend J for dinner. Forodhani Gardens has this collection of street vendors quite unlike anything I’ve seen anywhere else. These vendors have tables simply covered in heaping piles of seafood, mostly organized by type in the form of kebabs. You just walk up to them and pick out the ones that look good to you, and they throw it on the BBQ grill they have behind them. I don’t remember everything we had, but seem to remember a kebab of Calamari, one with mussels, a giant crab claw, and one with prawns. The seafood is all fresh, as fishing is a way of life here, and all of these animals had very recently been swimming in the blue waters that were before us. We sat on a nearby bench after we placed our order, and they brought it over to us, along with the fresh juice drinks we ordered. The local stray cats came around, looking to share in our meal, so I threw them anything that I didn’t particularly care for, as well as the tails of the prawns and that kind of thing that I was done with. These cats are definitely living the life with all the fresh catch around here!! We finished our meal with the dessert version of Zanzibar Pizza. While I didn’t get any pictures or videos of the Zanzibar Pizza making process, YouTube user natalyamarquand posted the above video of a traditional Zanzibar pizza (the savory variety, which includes unexpected things like La Vache Qui Rit type cheese and mayonnaise). The dessert version that we chose had Nutella (yum!) and fresh mango slices (double yum!) in it, and it was delicious!! And watching them make it in front of you adds to the whole experience. I really enjoyed this evening in Forodhani Gardens! Another lovely evening out in Stone Town with J included a delicious steak dinner at Tatu. 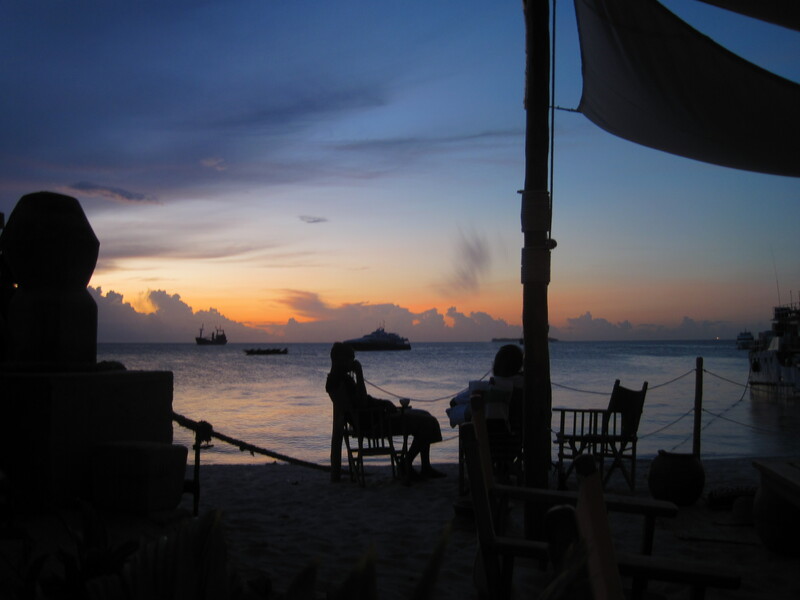 Tatu came highly recommended by another work friend, S, who works in Dar Es Salaam but comes to Zanzibar frequently. Our meal was pricey by local standards (still a great deal by US standards, especially for steak), but in retrospect I can’t say for sure that it wasn’t the steak that made me fall ill the following weekend….. though I still prefer to think that it was the coconut milk (which is apparently notorious for causing severe food poisoning when not properly attended to) rather than to taint the memory of this wonderfully delicious meal! It was so good that even if it did cause the food poisoning, I think it would even be worth it to have it again. As a side note, J had the same dish as I did here and didn’t get sick, but she did not have the coconut milk drink I had, so all signs really do point towards the Passion Colada. We sat on the balcony of the restaurant, and enjoyed our steaks with a nice glass of red wine. What a nice way to spend an evening!! Another nice spot to spend an evening was the Livingstone Beach Restaurant & Bar. It’s popular with the expats, so you don’t have to feel self-conscious as a woman if you want to wear something that exposes your shoulders, and it’s the one place where I really felt comfortable in a tank top. The people watching is great, and if you get there at the right time, you can watch the loading up of vehicles onto the ferry that goes to mainland Tanzania. This is entertaining because sometimes, driving across the beach to get to the ferry, cars or trucks get stuck. Then everyone gets some entertainment while other trucks come to the rescue, trying to get them unstuck, and when that finally happens, the crowd of onlookers raise their frosty beers and cheer. Simply entertaining. 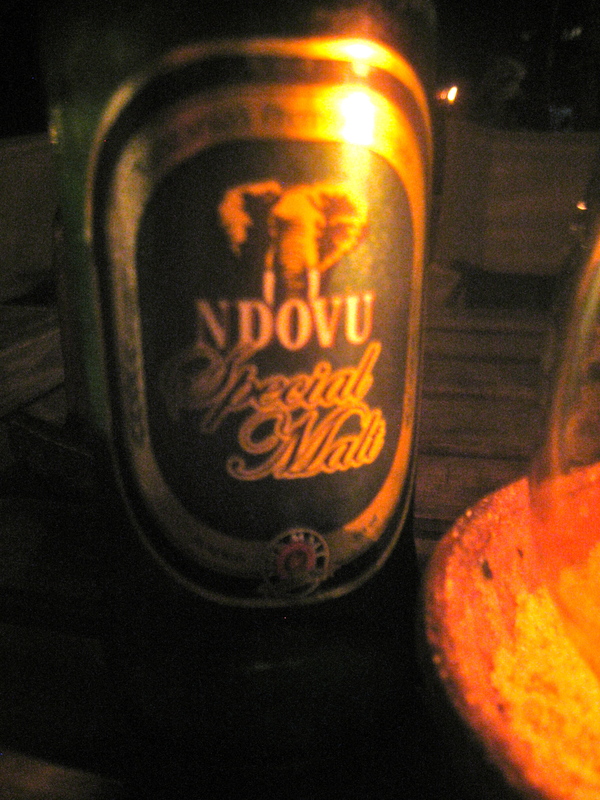 The food was not bad, and the wi-fi from my hotel reached the outside porch here, making it a great place for me to go and do some work on my own, while sipping an Ndovu (which means elephant) beer and watching the sunset. I spent at least 3 evenings here, and enjoyed each one. Until next time, I remain your ever-adventurous, Travelling Chitalian!